It's been a while since we suggested some places to visit? Hey, we'll have a review of Neon Retro Arcade after the weekend, thus completing our guide to all the arcades in LA again. There's only so many. What are some things to do in LA, eat and play, my friend. Eat and play. This is a new one, we haven't mentioned them before, but Primo's Donuts has been getting big, just too much hype. 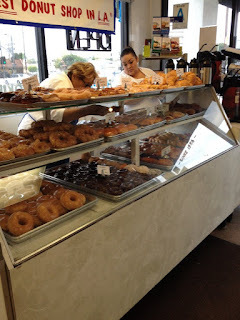 Forget Dunkin, this Sawtelle citadel of donuts keeps getting high praise. Unsure why it's so beloved, we don't see and special donuts. Here's their menu. They do have your bacon infused donuts, nothing that out of the ordinary. Could it be... just that their donuts capture that perfect flavor? Family run and has been around since 1956, they must be doing something right to stay in business this long. From reviews on Yelp, get there early, they only make so many. Next up, another place to fill your void of despair or hunger, it's Fair Oaks Pharmacy and Soda Fountain. Have classic drinks right out of the 1950's from phosphates to milkshakes. The biggest draw for folks are all the ice cream desserts. 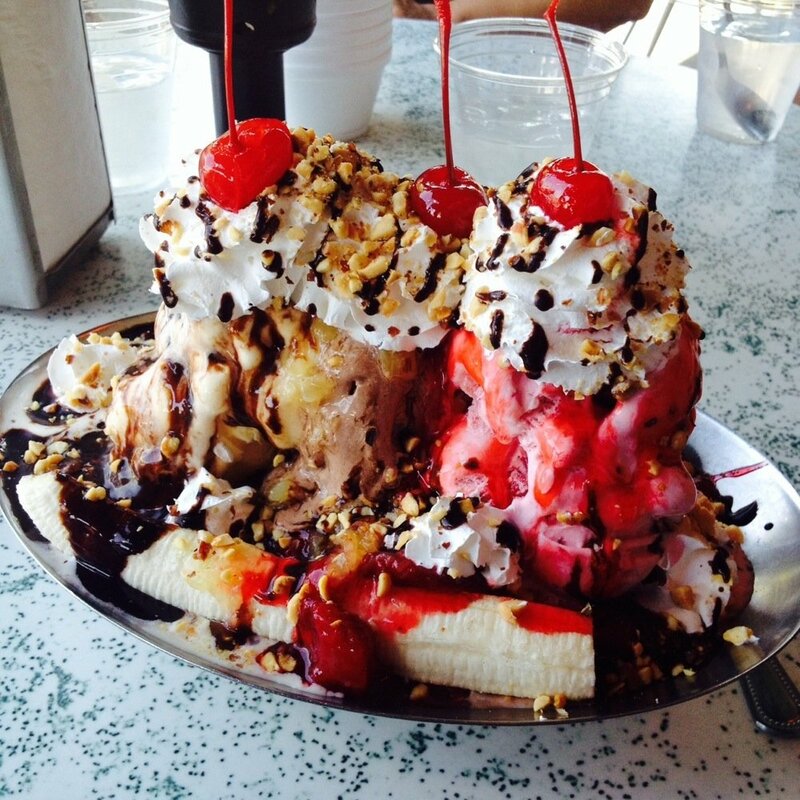 Banana splits, sundaes, malts and ice cream floats, you name the classic concoction they'll make it alongside huge portion desserts and classic diner food, aka burgers and fries. They even have an ice cream challenge! If you have friends, you now have a place to enjoy with them for many events and act out 1950's movies. If you don't have friends... try inviting someone here. Are you a carnivore, technically we're omnivores, unless your a vegetarian. 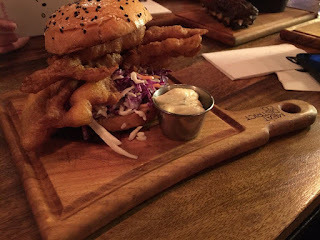 Vegetarians stop reading here, because Meat District Co. in Pasadena is not the place for you! So many burgers, so much meat! Why haven't we covered this place earlier? A huge selection of burgers, including the Spider-Crab burger, looks so good. Ribs up the ying-yang and combos to get them both. Their specialty, The Hook, a hanging kabob of NY sirloin. Forget Umami, head to Meat District Co.
Mini-golf and arcade games, is it a sweet-hearts weekend or a business retreat? No, it's just a place to be a kid again. 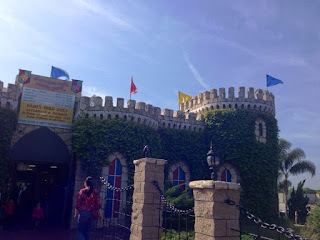 A friend of the site visited recently with his lover and mentioned how it has all the latest arcade games including Star Wars Battle Pod and some sort of an odd simulator for a "Wizard Battle." I'm not sure what to make about some sort of area where two can duke out casting spells. I'm guessing it's a fun sort of mick-up like their laser infiltration room. For those who haven't been there in a while they switched to a card system for the arcade, no more tokens. The is the only mini-golf course in town. Literally, you'll have to drive at least two hours before reaching another mini-golf course nearby. Three courses of fun to fill up an evening. There's still relatively edible food and batting cages, right after you can head down the street and catch a movie at the Sherman Oaks Arclight.